My mind still thinks like your first paragraph about this. I have low HDL and the doctor told me to stay away from Fat, especially saturated fat. They said that makes it lower. I have been reading alot about the oils that you mentioned and the hydrogenated forms of these seem to be the trouble makers. Not the pure forms. Its just scary when you are talking about your heart (and I am too young to worry about that, I think)!! Thanks for sharing!!! Absolutely agree! I have been reading Dr. Mercola’s book called, Take Contol of Your Health” and he recommends only Coconut Oil and Olive Oil. I am a believer in BUTTER and no margarine. I also use coconut oil on my face and it feels awesome and helps with these close to fifty wrinkles. Thank you for sharing! Appreciate it! kind of health problems. They also aim to raise the HDLs. food, though), and had a cholesterol nearing 200 at 20 years old. As long as you are aware, that is all that matters! Two questions–first can Palm Shortening be used instead of crisco shortening? If the answer is yes, then Whoo Hoo! Second, we avoid coconut oil simply b/c my youngest was diagnosed with a peanut and tree nut allergy. Since the FDA has classified the coconut as a tree nut (of which I think this might be debatable), I don’t want to run the risk of an allergic reaction to any food I prepare for my family. So, what would be a healthy substitute for coconut oil? We currently use olive oil, butter and canola oil. Thanks so much Laura…and yeah butter! YES, you can use palm shortening in place of crisco…SO EXCITING!!! I’d say you can use palm shortening in place of coconut oil too if you’re afraid of using it. I interchange the two depending on what I have on hand and it works just fine! I was also going to ask about a sub for coconut oil because I am allergic to just about every single nut out there, coconut included. In fact, it was one of the worst ones on my allergy test! Where can you get palm oil and palm shortening? I’d never heard of it before reading your post today. I’m with you – coconut oil, avacados, whole raw milk, olive oil…. I haven’t tried palm oil or shortening, but I’ll go look at that in a sec. (thanks!) I did try red palm oil after it was raved about in Above Rubies magazine – but the stuff was NASTY!! and RED! I figured if we couldn’t eat it, I could use it on my skin. wrong! recommend it to everyone (What the Bible Says About Healthy Living). refined food is really to blame! we just salt it and go! It’s yummy! And a nice treat from regular popcorn. I love this article and it hits the nail on the head. I use real butter and coconut oil and olive oil. I have noticed that my skin is less dry and I am actually losing weight. I am staying away from overly processed foods and anything with sweetner added, which is really hard to do. I shop at a local health food store for the more natural products. I grow herbs including Stevia (a natural sweetner) in my Florida Room year round. I would recommend Nourishing Traditions. It’s a cookbook with a chapter at the beginning on this subject. I think you would find it very useful and interesting. It covers some of that you talked about here. That’s what I thought of as soon as I started reading this post. Thanks for sharing–this is definitely a hot topic. I agree on all counts, but I do have a question…I have been reading a lot about how most canola oil we have access to is GMO. I really don’t use a lot of canola oil, but it is what I use to pop popcorn in. Popcorn is one of my family’s favorite snacks and it is so cheap to make! Does anyone have a suggestion for a good oil to pop popcorn in besides canola? I don’t think olive oil can be heated enough to pop popcorn in. I’ve read all kinds of bad things about canola oil (not that I can quote the facts now…) but I avoid it if at all possible. At the very least, it’s rancid. We pop our popcorn in coconut oil and it is the BEST popcorn EVER!! I second Laura – Coconut oil is 100% the way to go. We love air popped with melted butter drizzled over it! We always do our popcorn in coconut oil. It tastes great! at the movie theaters or from microwave popcorn. it’s great. The instructions that came with our oil popper tell you never to do this but we mix butter with olive oil to pop our popcorn. I use medium heat and our oil popper is stainless steel, so I figure I would saute some veg over medium heat in a oil/butter mixture so why not our popcorn? I also put the salt right in the popper too. Comes out buttery and slightly salty and delicious! What about grapeseed oil? Is it ok? I think that it is…I’ve not done much research on it, but from looking into it briefly, it sounds like it’s on the healthy side of things. I Love fat! We use real butter, coconut oil and raw milk here and I would never go back now. And the funny thing is…the further you get away from processed food and poor quality ingredients the more you see a difference in how you feel when you do have to eat it somewhere else. Plus, I notice a huge difference in how my kids act and feel as well. This was a great post Laura and I am right there with you! I’m slowly making my way to healthier oils (already switched over to good, real butter! ), but I’m still a little fuzzy on how to replace my old oils. Can coconut oil replace both vegetable and canola oil? Since coconut oil is solid at room temp, do you need to melt it before you use it? I just got my first jar of coconut oil and had success with my granola (yum!) but not with the sugar cookies (were really crumbly). I think this was because I refrigerated the dough. Any ideas? I just melt the coconut oil to use in recipes that normally call for vegetable oil. For cookies, I usually use melted butter. But hmm…I have a sugar cookie recipe that calls for a cup of oil…I’m not sure which oil would work with that recipe. That’s a bit different. I wonder if my palm shortning would work. Regarding palm shortening…I just got a gallon of it and it doesn’t expire until 2012! I have seen it in smaller quantities at Whole Foods, but I never have a hard time using my gallon bucket in time because it has such a long shelf life. You can get Spectrum Organic all vegetable shortening from either Azure Standard or Amazon.com. I’m sure you can find it other places too. The main thing is that it is actually 100% mechanically pressed palm oil. Not “vegetable” like crisco! It comes in 24oz tubs, and like Laura says, it has an impressive shelf life! Thank you for your perspective, I love your posts! My daughter’s allergic to dairy, so we use Earth Balance which I think is a little better than regular margarine. We also use coconut and the other oils you mentioned. The only thing I wanted to say is that there are some serious environmental issues with palm oil. Palm oil plantations are destroying habitat in Borneo and Sumatra. You can find sustainable palm oil, but it is rare. I used to work in a zoo and this was one of the issues that our teen volunteer group was very involved in. They have some credible information at the Cheyenne Mountain Zoo here: http://www.cmzoo.org/conservation/palmOilCrisis/. What are your thoughts about what they say there? It sounds like a good source to me. The palm oil that is used for most cosmetics, candies, processed foods, etc. is almost always not sustainable. It’s just one of those things to check the source on whenever you buy it. Thanks for sharing about the unsalted butter possibly having added flavorings. I buy unsalted butter, but will check the label before I buy more of the same brand. Thanks! I appreciate this distinction too! I was just in the grocery store wondering whicch was better. Thanks! After my husband was diagnosed with an autoimmune disease a couple years ago, we switched to using only real butter, coconut oil and olive oil (as well as switching to whole foods in general) in order to lower his inflammation. He is now feeling better than ever and has been able to lower his dosage of anti-inflammatories as well. We have found that REAL FOOD works better than medicine in many instances. I am definitely going to be making the switch. Hi everyone! I started eating like this a few weeks ago but am concerned I am gaining a few pounds! Any one go through anything similar when making the switch? Our family is right there with you! Except we have never tried palm oil or shortning, but I will now! We have been taking this approach to fat and eating this way for the last year and we are all very healthy and my husband and I are at the healthiest weights that we’ve been at probably since high school! It is SO freeing to feel good about eating real butter, whole milk, and CREAM! These have always been some of my very favorite things and to feel guilty about eating them was always so disheartening. I’m glad to hear about Rex Russell’s books because I have never read him, but I definitely will! I still use canola oil b/c of the expense, but otherwise we’re an all butter, olive oil family. I’ve been making changes slowly b/c the sticker shock is hard to get over sometimes. I’ll go for it w/ the “good stuff” and then feel guilty at times for the $ I spent. It’s so hard in that regard for me b/c the prices are so drastically different. To “do it all” so to speak in regards to healthy eating, one can end up spending 4 to 5 times as much $ as they would buying on the cheap. I know health costs must factor into my equations, but that’s harder to project. Any encouragement in regards to this dilemna? Mine did too! Stupid natural flavorings! ingredients/food are used up, I purchase the higher quality items. stock up on various ingredients that will show up throughout the month. towards buying those high quality items for stocking the pantry. Good luck! I absolutely agree. While, yes, there are some fats (like refined sugar, corn syrup, and such) that should be enjoyed sparingly, natural fats like real butter and cream, olive oil, avocados, buttermilk, etc are good for you! The way I see it, the more natural I can get our food, the healthier we are. And that includes our fats. We used to drink whole milk, but my husband just can’t get over how thick and rich it is. He grew up drinking skim and 1% (blech!) and we settled on 2% for the family so I don’t have to buy different kinds for each person. Just like all food, eating fats in moderation and keeping portion sizes in mind is the key to good health. My husband is the same way! I don’t drink milk, just use it in cooking,so I let him get 2%. I tend to agree that real stuff is a lot better than the fakey fakey stuff even doctors are happy to tell you to eat. When I tried low fat stuff, I gained weight instead of losing it. Plus I think with the full fat you get the full flavor and thus need less of it. I mainly use butter, olive oil and canola oil. I NEVER used vegetable oil. That’s worse than canola oil… horrible for your heart. Of course, now I’m off to find butter without “natural flavorings”. 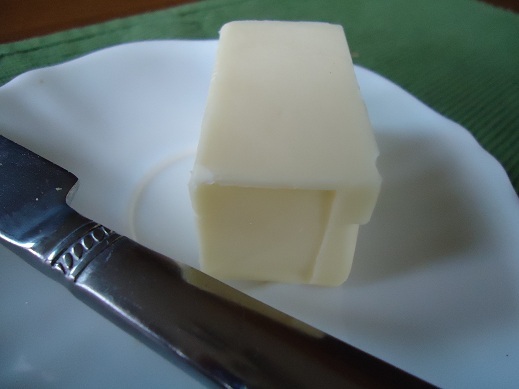 Organic butter usually does not have the added flavorings, but it’s always good to check. I trust most organic products to be good, but sometimes they still have funky stuff in there! I’ve never used palm oil, but I do get lard with the pastured half a hog I get each year from local farmers. I’m loving lard, esp. for pie crusts and tortillas! I’m frying some chicken in coconut oil at this very moment! It’s a common fear to feel like if you start eating fat, you’ll get fat. I was concerned about that too back when I switched over because the low fat thing had been so crammed into my brain. It makes sense that your digestive system is having a hard time with the change…your system is not used to it. Maybe go a little easier on the fats at first so your body can adjust (and your taste buds too). When I switched over many foods (not just fats) my body seemed to go through a bit of detox, kind of a “feel worse before you feel better” kind of thing. Not fun, but worth it! Ooh, and I didn’t get fat. I am a butter, cream and beef kind of girl and have not gained weight. Actually, the only time I start to feel heavier is when I eat too much SUGAR. Oh yeah…I did mean to mention that about the lack of exercise! That has been a huge factor, you’re right! I made the switch, and I’ve certainly gained weight. In my case, I don’t believe it is WHAT I’m eating, I think it is because everything tastes so much better that I’m eating MORE, and thus, the weight gain! I made the switch just this past week from skim milk (that me and my four year old drank like crazy!) to whole milk. I also made the switch to pure butter and olive oil as well! I have a question as well. I seen up in a previous comment that you felt bad before you felt better. Do you really, truly feel better? I drink Dr. Pepper like you did your Pepsi, but I feel so blah when I don’t have it. Your thoughts? (I don’t mean to get off the fat topic, just a question that popped in my head when I seen that comment!) Thanks! Oh yes, I feel TONS better! Pepsi (or DP in your case!) only makes us think we feel better when we have it. Now that I’m off of it and my body is used to not having it, I feel energized like Pepsi NEVER could do for me. Plus, I’m sleeping much better and without all that sugar, I’m not nearly as sluggish like I felt when I “needed a pepsi”. Well, I guess I am going to give up my DP! Lol! Thanks for all your insight and willingness to share! to give up Pepsi about 2 months ago when I started eating more real foods. the horrible things I was doing to my body by drinking that stuff. eating wise and I know the weight will follow! Thanks for this post. I sometimes feel like I’m the only crazy person chowing down on whole milk and real butter. I find that as I eliminate processed foods from my diet I am becoming healthier. Since I switched to whole fat dairy 7 months ago I’ve lost over 20 lbs. I firmly believe that fake food is making us sick. Oh I love fat! Real fat! Butter and coconut oil are my favorites. And full fat dairy. When I went in for my first prenatal checkup they told me to drink 1% milk, eat lowfat, NO BUTTER, just margarine and “healthy vegetable oils” because I “don’t need all that extra fat” (their words). HA! They haven’t questioned me about my diet, and I haven’t stopped eating the good stuff and I only gained a pound in 8 weeks! That is sooooo great! How are you doing now? I have had great energy and mood, especially compared to my last pregnancy! avoid sugar, and make sure you get lots and lots of protein! Don’t you just love the proverb in Nourishing Traditions? We are in the process of switching to “real” butter and getting rid of canola oil. Thanks for all your wonderful, helpful, healthy ideas. Love your site. The palm shortening can be used to make icing for cupcakes & cakes and tastes really good. Also, if you look at who recommends you eat certain things or avoid certain things..you will see where their allegiances lie, the commercials on tv advocating high fructose corn syrup were paid for by the Corn Growers Assoc. Alot of the “diets” recommended by dr.’s of organizations are sponsored by a “healthy” fat company. They aren’t going to tell you not to buy their products, their paychecks depend on it. A couple of years ago, we switched to butter, whole milk, whole grains, etc. It is a switch to your body, but you get used to it. A really good incentive is to “google” search a product you have questions about, but only read the articles by independent researchers ~ they are honest! Then its not to hard to switch. When I read how margarine was made, I threw it all away! Nasty stuff. I follow Mercola.com blog he agrees with you and you will find this and MORE there. Deep frying with olive oil is addressed and high heat is bad for olive oil apparently. Coconut oil has designations on the kind I can find for low to med and med to high heat also. I use coconut oil and butter too. Hmmm…thanks for the suggestions…I don’t have a popcorn popper. I just cook mine in a sauce pan on top of the stove the way my mom did when I was a kid. She liked to use bacon grease to pop it in. As far as the coconut oil goes, do you use the unrefined? I don’t have any of that, just the extra virgin. I just may need to get some! Laura you are a BRAVE women. I am with you on the fat thing but people look at me like I am craaaaaaazy town when I talk about saturated fats being healthy for them. I think that the China Study was done on cows milk that is from cows that are corn fed and live on feed lots…not on cows that are grass fed and have wide pastures to eat from and breathe in and walk around in. I think that milk is not milk is not milk, and there’s a big difference between store bought milk and raw milk from farmers who raise their cows on grass. I’ll try to address this further in a post I’ll write about dairy. I will admit that I haven’t studied too much about goats milk, but I truly do feel like the raw pastured milk we get from our local farmer is FANTASTIC for our health!! Such a good question you ask…it’s on my list of subjects to address in this series! Okay, what about Olive Oil? What’s your question exactly? I had listed Olive Oil as a good fat in my post, so I’m not sure if you’re asking some specifics about it or what exactly? Let me know and I’ll try to address it! I wanted to know about this as well. When cooking could you switch olive oil for butter or it to be a bit more weight loss helpful?? I found a recipe almost identical to your whole wheat bread Recipe but it had olive oil instead of Butter. What are your thoughts. You can definitely switch out olive oil for butter in making bread. It won’t make a difference in weight loss. But it will work in the recipe. Butter or olive oil or coconut oil…these fats don’t cause weight gain…they are natural and digest naturally in our bodies. Fats that cause weight gain are the new, unsaturated fats (vegetable oils) which our bodies don’t recognize as readily…therefore they tend to turn to fat in our systems. thanks. It has been fun trying to eat better. Love this whole wheat recipe. I also bought the white whole wheat and like it so much better than store whole wheat. I recommend that everyone read “Real Food” by Nina Planck. I learn alot about real food from her, including the kinds of fat that’s good for us. I really like using lard in baking. It makes delicious tortillas, and I use half lard and half butter to make pie crusts, which provides the perfect balance of flakiness and buttery flavor. At my house we buy real organic butter by the case! We also use pastured beef tallow and lard. My favorite fat in the world has got to be bacon grease though! Oh, my mouth waters just thinking about the yummy aroma! :OP I’m trying to get into this coconut oil thing, but I hate the taste and smell of anything coconut (I know – I’m a freak!). We do NOT use vegetable oil, shortening, margarine, or canola oil. We consume raw full-fat milk and when not making our own dairy products, try to buy them as fatty as we can get them. :O) “Skim/part-skim cheese” – it’s absurd! OT ? Laura, can I use my home-made kefir in place of buttermilk in your recipes, particularly with regards to soaking my grains? This is a complicated issue if no other reason then that people are all different. Fats are an essential part of our diet but some people have health problems that can be helped by cutting fat consumption. That does not mean that healthy people will avoid those same problems by cutting fat consumption. At the turn of the 19th century people generally didn’t live long enough to die from the big three (heart disease, cancer and stroke) and even when they did die from one of these the doctor didn’t always know it or annotate the death certificate correctly. It is exactly because we are so much healthier today and live so much loger that most of us die from the big three. It is easy to jump to the conclusion that this represents some kind of epidemic and must be caused by something. Some claim it is consumption of: fats, sugars, refined carbs, meat, HFCS, rock and roll, etc. Take your pick. But “real” studies have determined that for most people none of these foods either in excess or moderation is harmful. Of course there are plenty of non-studies that claim otherwise and if you google your favorite culprit there will be plenty of official sounding non-studies and outright quacks to support your bias. Bit it comes down to this: Eat a varied and balanced diet, avoid fad diets and if you have a health problem follow your doctors advice. I have a can that I have used for a long time called a Misto. I just put the oil in and pump it up and it makes it into a spray just like those nasty silicone based non-stick sprays. I have always used olive oil in mine. Hope this helps! Laura it never ceases to amaze me what I learn from you. I didn’t know there was such a thing as palm shortening. Thank You! Hi Laura! Your thoughts on Grapeseed oil? I really like it, but haven’t seen much about it. Thanks for looking into that for us! I guess that helps answer the question! Hey I just wanted to ask about something. When you were talking about butter you said it’s best made from RAW, PASTEURIZED cream but I was under the impression that if dairy was RAW that it was NOT pasteurized. Am I mistaken? Ah, that is very confusing. The word I wrote was PASTURED…not pasteurized. Pastured, as in, grass fed. I should have written than more clearly! Right…I’d say most raw milk does come from grass fed or “pastured” cows…but some still feed their cows corn or other grains. I make my own soap…have for years, and I use olive, palm and coconut oils. I am now looking for a food-grade source of these oils…I have not seen any reference yet to Azure Standard. You might want to check this site out also as a source for a lot of organic and natural foods. There is a minimum order but my daughter and I share orders so it works out fine. This might be a funny question but can you use palm shortening in conventional cookie recipes that call for shortening? When you see “natural flavoring” listed as an ingredient do they mean MSG? I have always wondered. i watched on the “doctors” show and it said that any oil you fry with when its put at a high temp it makes a tras fat…(if this makes sense) is it true? i would hate to not fry anything…they say you can fry with beef tallow or lard…? just wondering? Yes, I’ve heard that also, which is why I avoid frying. However, coconut oil as well as beef tallow like you mentioned are more stable fats, which means they don’t turn to trans fats when heated to high temps! My husband and I believe in eating whole foods, including full fat dairy. But I have an autoimmune disease and have heard that dairy fat can cause inflammation. I was wondering if you’d heard anything like that. We drink whole raw milk from the dairy usually, and sometimes whole milk from Braums. I’m just kinda wondering, which is worse? Inflammation from the fat or the unnatural low-fat milk? I suppose I could get low fat raw milk from the dairy as an option… I’d appreciate hearing your thoughts on this if you have any. If it were me, I’d go with raw if possible. You could always skim the cream off if you needed to, and the raw would be much better because of the natural enzymes it contains. I hate to admit this… but I just ran out of canola oil. And I’m not wanting to buy anymore! (yeah) I’ve heard pure olive oil doesn’t have the strong olive taste like the EVOO does. Is pure olive oil okay? What are your thoughts on it? I don’t fry a lot of things but currently i’m on a “kick” of browning turkey sausage after boiling it. And not sure what I can use in place of a mild oil like canola. I do have coconut oil, but it is the organic, not sure if I want a coconut tasting turkey sausage lol. Hey Laura! I’m good… Christmas is coming, so that will be the hardest one yet. At least it’s the last “first”. I hope you are feeling better. Being sick stinks! Nope, I wasn’t going to buy canola again! AND I was at new to me grocery store, (not a new store, new to area, I just never went there, kinda out of the way) and I found sucanat! And of course I bought it. 2 lbs for $6.34 (high huh?). I was just so excited to find it! I might have to shop at this grocery store more often. The pure olive oil seems to be working well. Can’t taste it! I’ll have tocheck out the palm shortening and or expeller pressed CO, especially since it’s Christmas cookie time! So is Coconut Oil interchangeable with Palm Shortening? Is there a reason or occasion to use one and not the other? Hello! I was wondering what your thoughts on lard are. I would say that if it comes from a source you trust, lard is good stuff! I live in South Africa and I haven’t seen palm shortening in the grocery stores. I have recently seen something called Holsum. On the back the ingredients say: Vegetable Fat (palm fruit, palm kernel), Vitamin A, Vitamin D. It also says suitable for cooking, baking, and frying. It comes in a bar like soap wrapped in paper. It is white and solid and is sold on the shelves, not in the coolers like margarine and butter. Is this like palm shortening or is it something unhealthy? Hi, Laura – I finally bought some coconut oil, but bought “refined” as opposed to the unrefined and virgin; do you think that is an issue? Also, I noticed you mentioned stir-frys with olive oil. I have used eevo for cooking foods but now am hearing that even olive oil is adversely affected at high temps. Wondered what your insights on that were, as well as thoughts on cooking with nut oils (peanut, walnut, etc.) As there is ground beef in my fridge that needs to be browned, I’m going to try a little of the palm shortening for today (melted down…have never done that):-)! Thanks much! Thank you, Lindsey and Laura! I didn’t see lard mentioned – homemade, only pork fat, lard…not the stuff called lard that sits on the grocery shelf. From my research thus far, it appears to have many wonderful qualities and benefits.